I have been one busy bee this week. 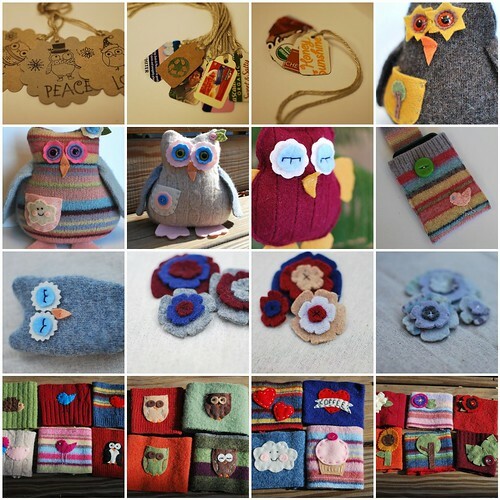 I completed a wholesale order for 20 coffee cozies and one owl. I made 2 more owls, a couple of gadget pouches, an owl ornament, some pretty flowers, and some recycled tags to put up in the shop. Now I just need to find the time to edit the photos and actually list them. Hopefully I will be able to get some items up today. I have 2 more wholesale orders to finish. The sleeves are all sewn and just need to be embellished. I have 4 half done owl ornaments and a whole pile of pieces to make more ornaments. Plus a whole stack of tags to photograph and stamp. Then there are the ideas in my head that I haven't had time to get to yet. I know it will all get done eventually. Sigh. you are on crafty fire! holy cow...go, jen! i love it all, as always. i wish i could just line my office in your owls. they would make me smile every minute of every day. those crafty things you make are sooo nice...it's hard to have ideas pushing at you and not enough time to get to them all, eh? your productivity just amazes me. Everything looks SO GOOD! Wow, wow, wow...you have been a busy bee this week! Looks great...all of it. I always love to see how creative you are in your upcycled products. It's wonderful that you are doing so well with getting wholesale orders, too. Well done! Where do you find the time? I love it all. Wow, Jen, you are one busy woman! So excited for you and all of the success you've had with your shop. I think you have great branding already...a look that really ties all of your items together! Can't wait to see how the next year goes!